THE ONE WHERE It's 2036 and the Earth is under the control of the Observers. Walter and his now-legendary 2012 Fringe team are rescued from amber suspension by the resistance. Can they help fight back? UNIVERSE Over here but in the future - special totalitarian credits. VERDICT Kicking off with a Blade Runner or even BSG -style introductory crawl, the unusual tone is set from the beginning. With the fresh location (looking expensively movie-like even though it must have been done on a TV budget - if only Being Human 's future vampire state had looked more like this) and that thrilling Big Brother intro sequence, this breaks with the continuity of the season and creates a whole new scenario. It's a testament to how confident Fringe is with its premise that it can easily spend most of the episode following entirely new characters! 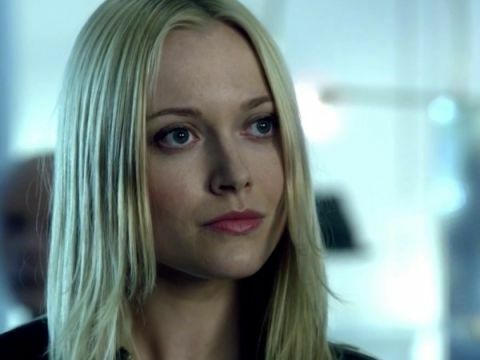 Georgina Haig is well cast as Fringe agent and rebel Etta. Although we don't officially find out until later, the fact that she looks like an exact cross between Anna Torv and Joshua Jackson, and sports the same straight blonde hair as Our Olivia, is a dead giveaway. When Simon bluffs a security officer by calling Walter her grandfather it's a not-very-subtle nod to the genuine relationship: he was (perhaps unknowingly) telling the truth. I realised by about half way through the story that I'd happily watch this pair of agents in their own stories. Even if Henry Ian Cusick is channelling Noah Wyle from Falling Skies , there's an understated rapport between these two which reminds me of Peter and Olivia's early days. And speaking of our regular heroes... John Noble: what an actor. How many subtle variations of Walter has he portrayed now? And here we have him turning from our child-like, candy-loving, drug-taking granddad into another version again - the same chap but with the "dark" piece of his brain re-inserted. Just minutes apart we see Walter quoting Star Wars and begging for snacks, and then him ruthlessly blowing up a group of Observers inside a building and cutting off William Bell's hand. The story has a gripping mix of comedy and drama, and it's a moving moment when Simon sacrifices himself to get Peter out of the amber (followed very soon by the reveal that Etta is Peter's daughter). So why not the full five stars? Not because it's an unfinished story - I totally accept this as the start of a sequence. It's simply because it feels like a sudden jolt just as Fringe was getting interesting again. Where's Olivia and the dilemma about her new personality? Where's David Robert Jones and his hybrids? Where's Lincoln and Fauxlivia getting over the recent death of Captain Lee? I adored this episode but it's at the expense of the other narratives we were following. As long as this publicity-stunt shake-up of the arc properly plays out in subsequent episodes, I'll be content. IT'S WOSSISNAME Etta's partner, Simon, is played by Lost 's Desmond (Henry Ian Cusick). REFERENCES Beautiful nods to sci-fi culture with Walter's "I am not a number I am a free man" ( The Prisoner ), "These aren't the droids you're looking for" and "move along!" ( Star Wars ). Walter also mentions The Guns Of Navarone later. NITPICK Walter's antimatter explosion wipes out an entire building - but it's a peculiarly tidy vanishing trick. Where's the city-wide devastation? THE CREDITS The unique 2036 credits shout out to the following 10 "fringe" ideas: community, joy, individuality, education, imagination, private thought, due process, ownership, free will and freedom. OBSERVING THE OBSERVER Everywhere, in plain site, all the time. It's their world, even if they seem to be aggressively out of character from what we know of them previously. THE 19TH The 19th episode of last season was equally bonkers: it was "Lysergic Acid Diethylamide", the animated one (hang on: what happened to that villain who was chasing Olivia on the airship?). Assuming there'll be more seasons in future, will the 19th now forever be the outré one? I AM NOT SPOCK Fantastic glimpse of William Bell (Leonard Nimoy) in the amber. Nice nod to his contribution to the show. And a gross touch at the end: his hand, stolen by an uncompromising Walter. THE TITLE "Letters of transit" feature heavily in the classic film Casablanca , and refer to stolen papers which permit free travel around German-occupied Europe. SPECULATION Walter becomes a lot harder, more destructive and brusque when the piece of brain is inserted; his sweet self is gone. Does this mean he's going to be more like Walternate going forward? Walter: "I've eaten it once." Fringe airs in the UK at 10pm on Wednesday nights on Sky 1 . It's repeated on Sky2 on Thursday evenings if you miss it!